Another amazing day at the South Adger’s Wharf dig site! While the bulk of yesterday’s activities focused on studying and recording the soil strata uncovered during the first two days, the highlight of today’s work was the revelation of the main body of the brick redan that dates back to 1696. On Friday we uncovered a substantial brick fragment, about 1.5 feet thick, that we knew had to be part of the redan, but some aspects of its position and orientation raised questions about its precise identity. 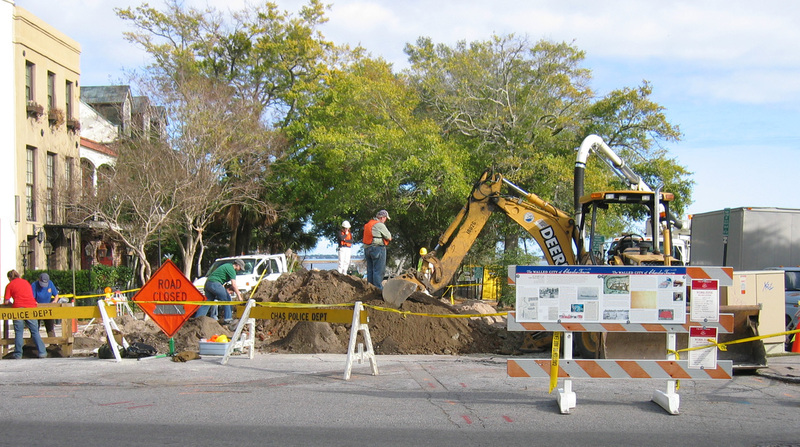 After Trench 2 was continued several feet westward (towards East Bay Street) today, however, archaeologists Eric Poplin and Ron Anthony discovered another large brick fragment behind the first, and then another, larger brick mass behind the second. After washing away some of the mud, voila! We found the main body of the redan! We soon realized that our suspicions about the orientation of the brick fragments encountered earlier were well founded. Our best theories about the location of the redan were based on a highly-detailed 1785 plat drawn by respected surveyor Joseph Purcell. On Friday of last week we thought we might have found part of the south flank of the triangular redan, when in fact we seem to have found part of the north flank of the redan wall! Hmm, Mr. Purcell’s plat apparently isn’t as accurate as we had hoped. The two thinner brick fragments, visible in the photos above, probably represent part of the uppermost part of the wall—the parapet with embrasures or openings through which the cannon once projected. It seems that the upper parts of these walls may have been simply knocked over in 1785 and allowed to tumble eastward into the mud. Once the mud was cleared away from the redan, we were able to get a good look at it for the first time. 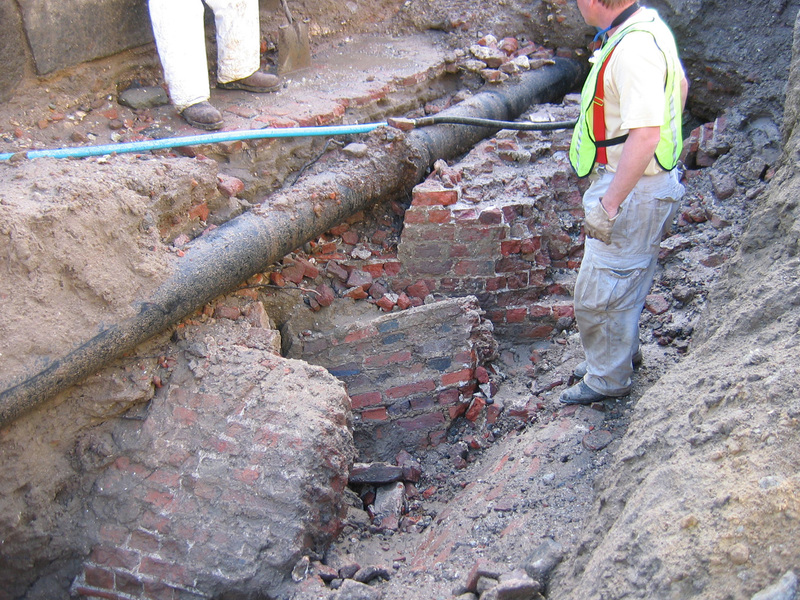 Even though the uppermost, above-ground mass of the redan was demolished about 1785, the remnants, located only about three feet below the modern street level, are five feet wide and composed of solid brick. The inner or westward face of the redan, seen in the photo to the left, presents a flat and uniform surface, and is laid in English bond pattern. In contrast, however, the outer or eastern face, seen in the photo to the right, is slightly raked or sloped (approximately one inch to the linear foot). 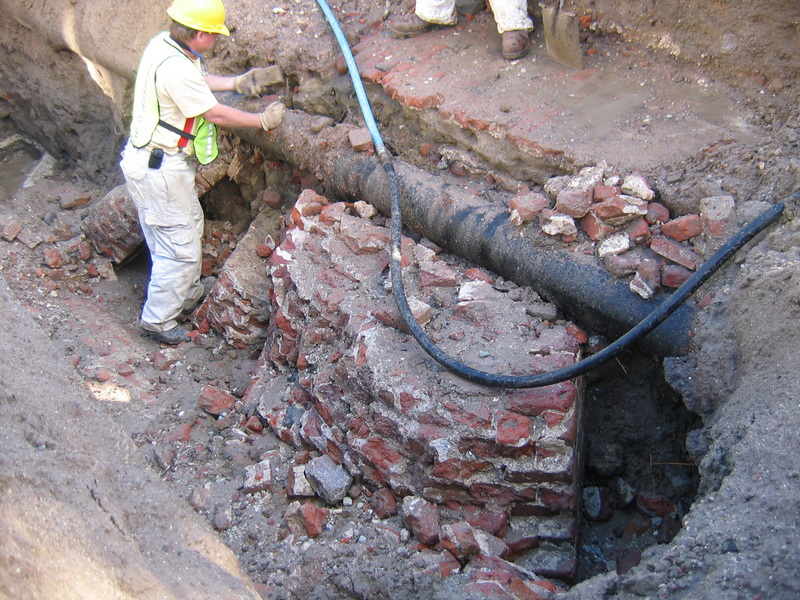 These characteristics are familiar to members of the Mayor’s Walled City Task Force because they match exactly the surviving brick work of two contemporary structures: Granville’s Bastion (under the Missroon House, the headquarters of the Historic Charleston Foundation) and the Half-Moon Battery (under the Old Exchange Building). On top of the remnants of the redan—and perhaps at a consistent level throughout the eastern end of the dig site—is a single layer of thin paving bricks (see the topmost photos above). Martha Zierden suspects that these brick pavers represent the floor of the Lower Market, which we know was extended westward in 1786 over the ground formerly occupied by the redan. Martha will continue exploring this possibility in the next few days by continuing to take precise measurements and elevations of the site. A big thank you to the volunteers who are diligently screening dirt for artifacts. 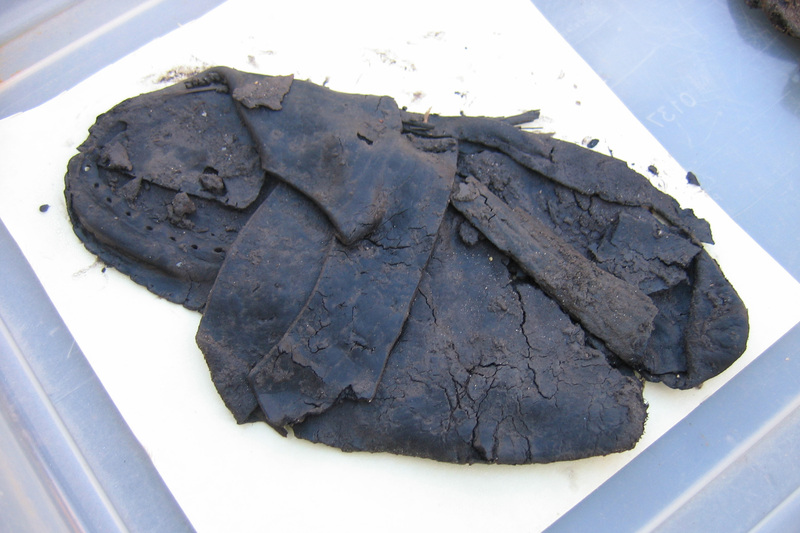 Without their hard work we wouldn’t be able to find such interesting articles as ancient leather! If you’d like to volunteer, or to contribute towards sustaining this project, contact Katherine Saunders at (843) 723-3646, or email her at ksaunders[at]historiccharleston.org. Fantastic work on the redan recovery. It’s as if you dropped the shovel and uncovered the late 17th century. Obviously, there’s alot more to it than that, but such quick results are amazing. Your photographs are wonderful and I take special interest in the brickwork and mortar. The bricklayers in the Charleston area seemed to persist in their use of English bond long after other areas began using common (3 to 1, or 5 to 1) bond, which makes dating brickwork a little tricky. 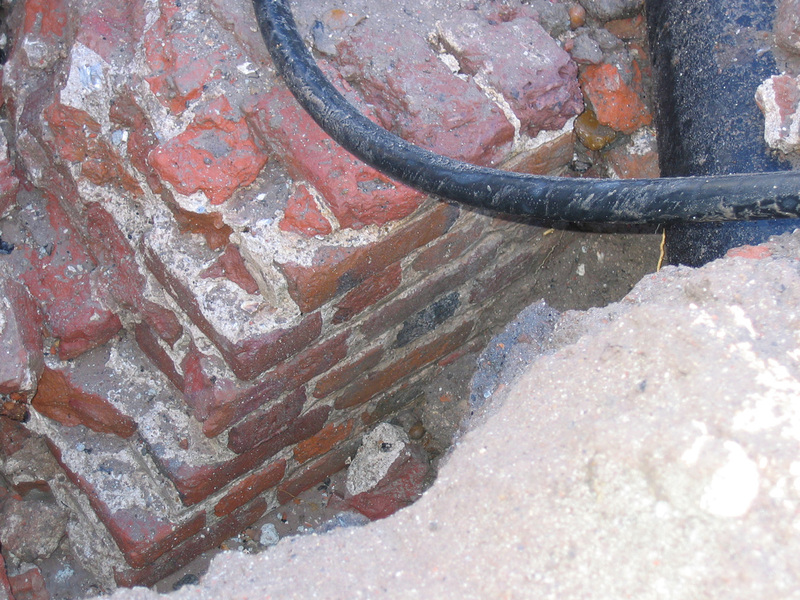 But, your photos seem to clearly indicate you’re looking at late 17th and early 18th century brickwork. In fact, the bricks and mortar remind me of a couple of extant buildings on Tradd Street east of Meeting. All I can do from Raleigh is exhort your group to keep up the great work and I look forward to more brickwork photos! If I lived near Charleston and had the time, I’d be out there volunteering like crazy. I’d say the dividend is being paid pretty quickly. Good observations, John. I’m fascinated by the brickwork, too. It’s so important for people to realize we’re talking about really massive, complex brickwork, not just a simple pile of blocks. The sheer quantity of predominantly locally-made bricks, laid in such complex angles and patterns, is a humbling testimony to the skill and perseverance of the English masons and enslaved African laborers who created these works to protect Charleston three hundred years ago. Excellent points, all. From the photos, I am getting a small glimpse of the complex angles. 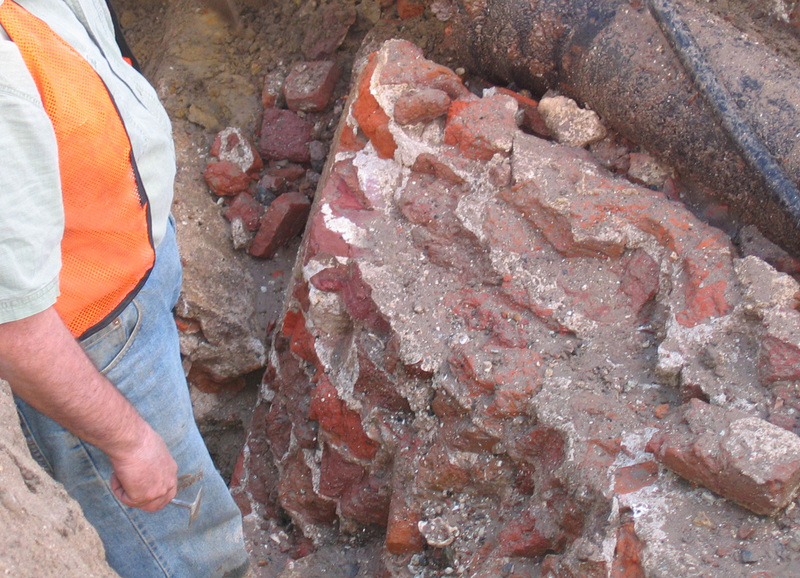 I’d be interested to know if the team believes they have uncovered any layers of brickwork which were originally above ground. If so, do you see any difference in the mortar finish? Thanks for your attention to this blog and for the team’s hard work! Please let me add one more observation. When I say Charleston bricklayers persisted in their use of pure English bond (one to one, headers to stretchers) they were, in fact, continuting to use a superior brick bond. Using a 3 to 1 or 5 to 1 bond is, essentially, cheating the structural validity of the brick masonry. A little off topic, but I wanted to clarify an earlier statement I made.